OK, so I admit it, I'm addicted to cake balls and the pursuit of the best combos. Here I tried the strawberry cake mix with strawberry frosting and chocolate coating. (For recipe look in my blog under Valentine Cake Balls.) They taste good, but still, the red velvet are the best. The strawberry has an "artificial" taste...I think next time I'll try an actual cake recipe to see if it turns out better. One hint if you're making light colored cake balls - trim the crust with a serrated knife before processing in the food processor. It makes a much prettier inside. Enjoy!! I had some extra chocolate after playing around with some extra cake balls. The idea for this heart came from a segment I saw on Regis & Kelly. Very easy to make chocolate hearts! Just make two "squirts" of chocolate next to each other. Then, with the back of a spoon pull them down until they meet in the shape of a heart. Sprinkle nuts, candy, cherrios, really anything on top. Yummy! So I took some red velvet cake balls to a friends birthday party. I've got to tell you, I'm even shocked at how good they are for WHAT they are!! Here is the recipe for all of those sweet, new friends that want to try it themselves! 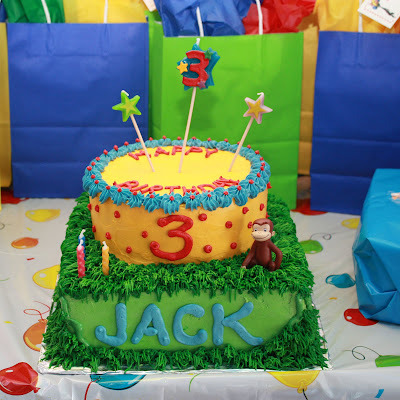 After cake has completely cooled, cut into large chunks and put into food processor. Process until a fine crumb. I usually do this in about 3 batches. Then mix in 3/4 can of frosting. Combine completely. Follow the steps illustrated below. If you have any problems, call me! Enjoy!! Here are the finished cakes balls...so pretty!! This is how the cake/frosting mixture looks after being mixed together. Note you don't see any white cream cheese frosting. Using a scoop helps keep your hands cleaner and the balls more uniform in size. Rolls the balls and place on a cookie sheet topped with wax paper or parchment paper. Place in the freezer for an hour or more to make dipping easier. I used the white candy melts from Hobby Lobby. Melt in double broiler or place glass bowl on top of large sauce pan of boiling water. The way I found to make them look the smoothest and cover all sides was to dip them twice. First dip them down as far as you can without getting the candy on your fingers. Hold them up until they start to set, then place on cookie sheet. To make a perfectly round ball, hold it until it sets before placing on sheet. It is easier to dip the other side, though, if you have a little bit of a "rim" to hold on to. Then go back and dip the other side. Give it a generous coating and it will coat not only the top part, but also the part you've already dipped, giving it a nice smooth finish. If you are going to add more candy coating, let it set up first. While searching the Internet for some cute ideas for Valentine cupcakes, I found the recipe for cake balls. It is so easy, not to mention they taste great!! I used a dark chocolate cake mix and cooked it the night before (hint from another blogger.) The next day, I cut the cake into large pieces. Instead of crumbing it up by hand, I chopped it up in the food processor. It took a couple of batches, but it was quick and easy. In a big bowl I put the cake crumbs and about 3/4 of the can of frosting (I used fudge frosting.) Then just mix with a spoon until well blended. Put some wax paper or parchment paper on a cookie sheet. Then, using a scoop, start making the balls. Using a scoop helps keep them uniform in size and reduces the mess on your hands. Roll the balls in your hand and set on cookie sheet. At this point, you can put cookie sticks in them to make "cake pops." The sticks make dipping them in the candy way easier! Just be sure to put the stick in before you pop them in the freezer. Once you have them all on the cookie sheet, put them in the freezer. Some blogs I saw said to put them in the freezer for 15 minutes or the fridge for a couple of hours. I tried putting them in the freezer for 15 minutes because I couldn't wait to start dipping them. This worked fine, but leaving them in longer was better. I didn't have time to finish dipping them all at the same time, so I had to leave some in the freezer for an hour or two. This made dipping in the candy much easier. To make the balls I tried a couple of different ways to dip them, but finally found a way that worked best for me. First I dipped the bottom half of the ball (the flat part of the ball where it was sitting on the cookie sheet) in the melted candy. I try to dip it in as far as I can without getting it on my fingers. I hold it out of the candy for a while, then place back on cookies sheet. By the time I get through with all of the balls, the first ones have hardened. Then I dip the other half into the melted candy, holding on to the already dipped part. I set it back down on the already hardened bottom half. They are smooth and perfect looking! Wait to decorate until they have all hardened. Just melt the color candy melts you want, put in zip top sandwich bag and snip off a small part of the corner. For the pink cake balls, after I dipped them them in the pink candy melts, I dipped the tops in white chocolate, put a candy heart in the middle and topped with nonpareils. Thought those were particularly cute. You should definitely try these scrumptious treats...you'll get lots of raves!! Good luck!! Haden LOVED his Spiderman cake!! I think this is one of my favorite cakes. Its so colorful and fun. Oh! Its tasted pretty good, too!! I made these party invitations out of yellow felt, fabric paint and t-shirt iron on paper for ink jet printers. They're in reverse...you peel the banana to find the party details. Under George it says, "Are you Curious?" We gave these as valentine's one year. So cute yet so simple. Just add red food coloring to the marshmallow/butter mixture before mixing with rice kripies. Then cut out with heart shaped cookie cutter. SIMPLE! I made these for a preschool class one year. The photographs don't show how sparkly the personalization on the cookies really was. They made me think of Cinderella pumpkins. The little kids really loved them! These are easy to make favors using pipe cleaners, googly eyes and tootsie roll pops. OK, so these pictures aren't as good as I thought they were...still haven't figured out how to delete/change pictures on this. Anyway, you get the idea...they're cute. The spiders were connected by filament to the bug box under neath the vellum invitation. I painted the boxes with acrylic paint, added spider ribbon around the lid and "sealed" the box with vellum strips and spiderman stickers. Close-up of vellum strips and stickers. Many of the invitations were passed out in class. For the ones I needed to mail, I found inexpensive, tiny cardboard boxes at Wal-Mart. I made this birthday cake for my sweet friend's little girl. She was having her party at one of the princess-type dress-up places. I think my friend used some long sparkler type candles on top. This was a yellow butter cake with the traditional french butter cream icing. It tasted as good as it looked!! Cowboy boot cake and invitation. Party details were on card that slid into boot topped with bandana print tie. To make part of the boot look like suede, I dusted it with cocoa. Table set up in foyer (party was in early January) ready for the cowboys! Party favors labeled with personalized sheriff's badges. I made this jail decoration out of plywood and rubber hosing. The rest of the details I had painted. For the boot invitation, I used leather and suede papers and sewed everything together with my hand-me-down sewing machine. 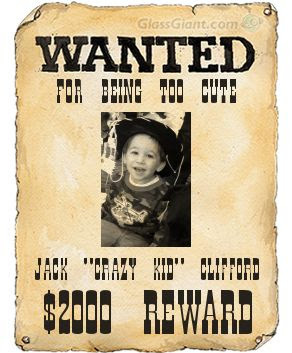 I used this as a guide to make wanted posters for all the guests, including the grandparents and uncles.